1 What are Complete Streets? 3 Where are Complete Streets Working Well? In the past, street designers and city planners have focused on creating roads for cars. Recently, there has been a movement that is picking up steam across the country to “Complete the Streets”. Complete streets are meant for a wide range of people and a wide range of modes of mobility. Complete streets are accessible to car drivers, bikers, wheelchair users, and walkers. The concept is pictured here. The design of a complete street is specific to the needs relevant to each community. For example, in places where buses are used commonly, often one lane of the complete street is designated exclusively for buses. Although design varies, the common theme for all complete streets is to be accessible to all people. nes are often built to slow speeding cars. Also, narrow lanes allow for space to build a lane designated for walking or biking. The benefits below are a compilation of ideas and opinions many of which are listed as “ metrics to measure” in the report, Measuring the Streets: New Metrics for the 21 Century Streets by New York City Department of Transportation (NYCDOT). These benefits ultimately provide safe, sustainable, economically competitive, and livable streets. Relevant terms are linked to the "Needs" and "Resources" sections of NORA. Lack of activity is an obvious contributor to obesity. Only 27% of people without safe places to walk within 10 minutes of home met the recommended activity levels. Because conversion of incomplete streets to complete ones is a new development, there is little information yet on long term direct or indirect affects of Complete Streets on health. Complete Streets will likely be correlated with decreased rates of obesity and related conditions and conditions such as asthma due to decreased rates of air pollution. Complete Streets are not meant to abolish the usage of motor vehicles or greatly increase the commute time for motorists. Complete Streets are meant to make driving more efficient while also keeping motorists and pedestrians safe. Prospect Park West street of New York city was previously a road with wide lanes and high rates of speeding cars. The street was reshaped by the Complete Streets Movement and now has narrow lanes, allowing for a protected bike lane and decreased rates of speeding. The previous design of the street accommodated the speed limit of 35 mph yet the current complete street has a speed limit of 25 mph. Exceptionally, drive time has been reported to be the same. The average speed of a complete street is usually 25 to 30 mph. Even with reduced speeds, car drivers often get to their destination in nearly the same amount of time due to decreased traffic (other modes available, less cars on the roads) and a smooth flow of traffic due to design. This decrease in car speed is essential to the wellbeing of pedestrians. If a pedestrian is hit by a car moving at 40 mph (65 kmph) the likelihood of pedestrian death is 90%. This fatality rate decreases to 45% at car speeds of 30 mph (48 kmph) and 5% at 20 mph (32 kmph). Safety is increased when lanes are specifically designated for bikes and walking. Often the walking lane of a complete street is separated by a median or further protected with a median with a plant or structural barrier between vehicles and pedestrians. The American Society of Civil Engineers states that complete streets will lower transportation costs. Americans spend 18 cents of every dollar on transportation and many families spend more money on transportation than on food. Inexpensive options, such as walking, biking, or public transport could replace the high costs associated with fuel and car maintenance. Family income could be used on other needs of the family. As reported by the National Complete Street Coalition for Economic Development, People living in Dallas, Texas save an average of $9,026 annually by choosing to taking transit options rather than driving, and those in Cleveland, Ohio save an average of $9,576. Also, as a side note, property value often increases due to interconnectedness and accessibility of surrounding streets. 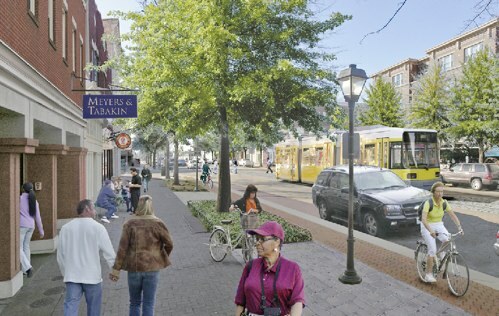 Jason Wexler, downtown developer of the Complete Streets of Memphis, Tennessee suggests that when more people have access to a street, more people move along that street and have access to local businesses. Local economies likely increase revenue due to complete streets while some companies such as car dealers and car repair companies may lose revenue. Also, when people spend less money on cars, repairs, and fuel, they have more money for other goods, likely leading to a local economic boost. After a bike lane was added beside Valencia Street in San Francisco’s Mission district, nearby businesses saw sales soar by 60%, which businesses attributed to increased pedestrian and bicycle activity. Complete Streets often contribute to a local multiplier effect. Complete streets help create an atmosphere where everybody, from toddlers to the aged, can make the outdoor environment a part of their home, rather than feeling alienated in an environment dominated by cars and designed for their speed. Where are Complete Streets Working Well? Many Complete Streets throughout the United States are working well. A recent study, Measuring the Streets by New York City Department of Transportation details the metrics used to evaluate street projects of New York City. These metrics are an example of performance standards to be used when evaluating success of Complete Streets. The five streets listed below are complete Streets that have been analyzed in the report by NYCDOT. The metrics measured focus on safety, accessibility for all users, and the enrichment of public spaces. The examples listed below are from the report and depict the current positive effects of Complete Streets. Successful complete streets are rooted in clear policy. Policy needed to initiate complete streets movement varies among regions. The National Complete Street Coalition has identified the top ten elements of successful Complete Streets. A strong vision: how and why the community would use the Complete Street. This map is an illustration by the National Complete Street Coalition from 2010. Each marker of the map denotes a region that has adopted a policy to build a Complete Street. Most Complete Street activity is in the eastern United States. Often Complete Streets rise up in heavily populated areas such as big cities including New York City and Memphis. This website is a great place to start if you would like to become involved in the movement for complete streets. The website explains the object of the Coalition and provides four ways to be involved: join the coalition’s mailing list, connect online with people working towards Complete Streets, become a member of the coalition, and donate to the movement. StreetsWiki "is a community-created, online encyclopedia for transportation, urban environmental, and public space issues. It's a place for ordinary people, planners, and academics to write and read about our cities and how we can make them more livable." Jessica Reader. Young Reno Activists Demand Bikeable Streets – And Get Them. Shareable, December 12, 2012. We are looking for stories by people who have experiences to share relevant to complete streets, getting them established, or how life changes if incomplete streets have been made complete! Contributions are welcome. The League of American Bicyclists and Sierra Club. 2013. Pedaling toward Equity.